Just when you thought things have settled in Québec, all three polls out this morning have the Liberals in the lead there: Léger and Mainstreet, both with a large sample of about 1,000 in QC, have the Liberals in first place at 31-32%, followed by the NDP at just 25%; Nanos also has the Liberals increasing their still marginal lead, 30.9% to 28.5%. What's more, according to Léger, it's a three-way race among francophones: 27% apiece for the Liberals and the Bloc, 26% for the NDP. This is all terrible news for the NDP: is its campaign, which has been steadily losing steam, crashing and burning in Québec in the final few days? Conversely, the Liberals get one more path to victory, and the Bloc's chance of retrieving official party status just shot up. Nationally, all three polls have the Liberals ahead by 5-8 points, and all three show an Ontario Liberal lead of 11-12.3 points. 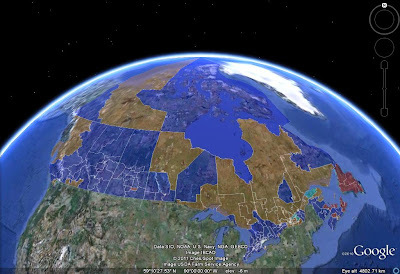 Suddenly, Ontario looks settled, and Québec is back in the spotlight. All three polls also show the following order in BC: Liberal, Conservative, NDP. That's another nail in the coffin for the NDP. 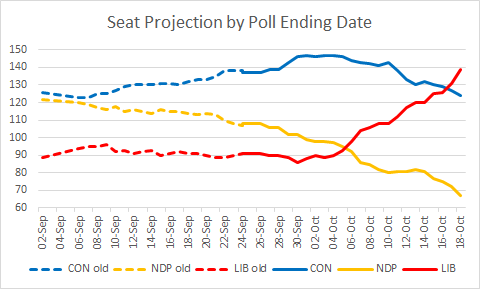 The Liberals have now taken the lead in the projection, albeit by a hair. It's really 50/50 at this point, if you believe the turnout adjustment. For a while, it looked like the Liberals would need to win the popular vote by 3-4 points in order to tie the Tories in the seat count. However, because the recent surge in Liberal support was concentrated in Ontario, the Liberal vote became less inefficient. That's a 15-20% chance of a Tory minority, a 75-80% chance of a Liberal minority, and a 5% chance of a Liberal majority. It's unclear whether we'll get final updates from any pollster other than Nanos and EKOS. (Update: In addition to Nanos and EKOS, Ipsos will be out with a final poll.) Hopefully Abacus, Forum (and maybe even Environics or CROP), Innovative and Ipsos will also give us a better idea of what's happening in Québec. 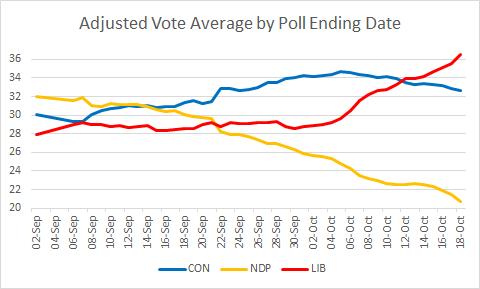 (Update: Abacus and Innovative will not provide another batch of voting intention numbers) It makes a HUGE difference whether the NDP is at 30% or 25% there. Abacus chickening out and not polling in the last week? Weird. Yeah... Abacus is a reputable firm, but this makes you wonder if they got results that look off and decided not to publish - they are apparently coming out with non-horserace numbers. Sorry, can you translate that last comment? Their last batch showed a tight race, and what they're holding back shows a big lead for LPC, or what? Mulcair has started airing ads in Quebec reminding voters of the sponsorship scandal. Let's see if this brings the Liberals back down. I am prepared for the worst. I just can't be optimistic ever again. Could be either - I have no inside information. Could also be for other reasons - I don't want to accuse them of anything as they usually do good work. @Gideon: Looks desperate at this point. If Léger is right, things might be moving towards the Liberals, and this could be a last ditch effort by the NDP. To your question on Abacus polling for the final weekend, am guessing you saw it already but for those who didnt, these are the non horse-race numbers that Abacus has posted for the final weekend. My hunch is that they werent sure how the race would play out so they felt they could map it through other questions instead. Or they have an idea but they want to be able to point out on why a certain result occurred. Since polling firm reputations are at stake here, I guess they are being conscientious. Yes, one hopes they aren't holding back the horserace numbers just to avoid being outside of the pack. They seem to be a responsible and credible firm, so I'd give them the benefit of the doubt.